Finally picked up my sketch book after several days. 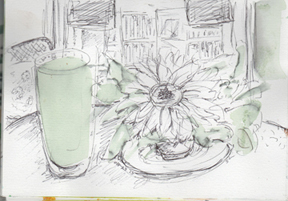 I tried sketching my matcha latte and flower-in-a-tea-cup in front of the connecting door to the book shop, in ink, prior to adding watercolor. But the ink ran when I put on the first strokes of a wash. So I tried again sketching lightly with pencil before dipping my brush in color. 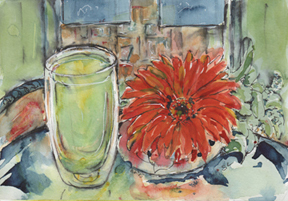 I'm not too happy with the results of this second try, although I do like the ambivalence of the background. The bookstore shelves look like a city scape out a window at night. Later, I looked at the ink sketch and decided I really like it better, so I finished it. I think the composition is better, and so is the drawing. What do you think?